Emma inspired me to create a mix and match dots and stripes mani after we created something similar on her nails recently (here). I often find it difficult to get a mix and match design right, they tend to turn out looking a bit crazy! I took influence from Emma's soft colour choices and mixture of simple patterns for this design. The polishes I used for this are Barry M - Greenberry, Cappuccino and Gold Foil, and Rimmel - Princess Pink. I also used a white nail art pen for the stripes. The mix of turquoise and neutral tones is lovely for this time of year. It's also a great way to re-introduce brights into your nail colours pre-summer! I tried gold dots instead of studs or decals to see if it would work and I really love how it turned out. 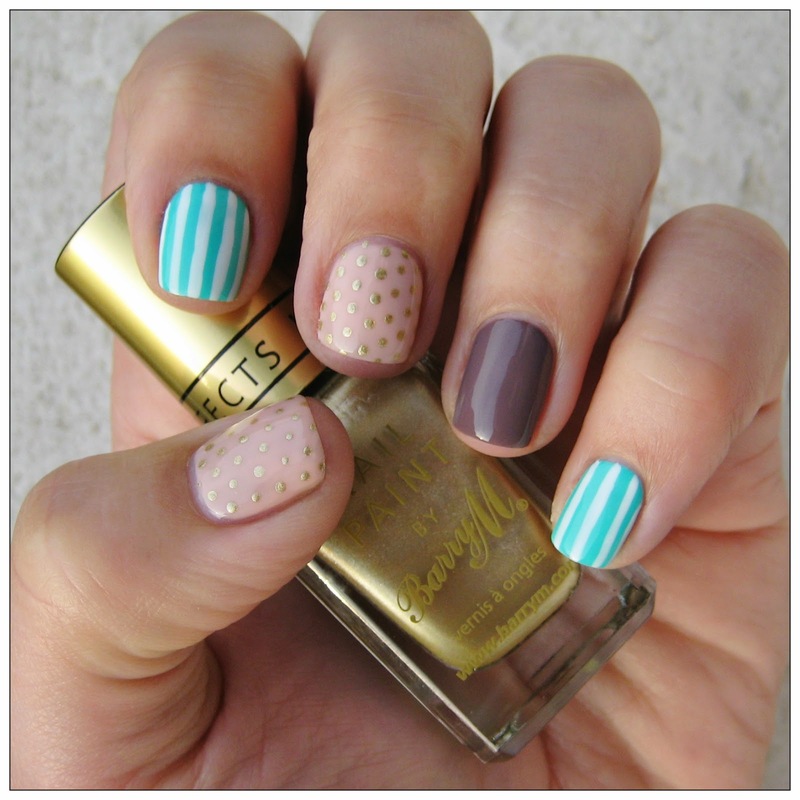 I worry about using nail gems as I'm not too careful with my nails, so this is a nice way to get a similar effect. Love Love Love the gold dots. Definitely going to recreate this look on my blog!